I recently went through the Rosetta Stone Navajo course, and overall I was pretty happy with it. 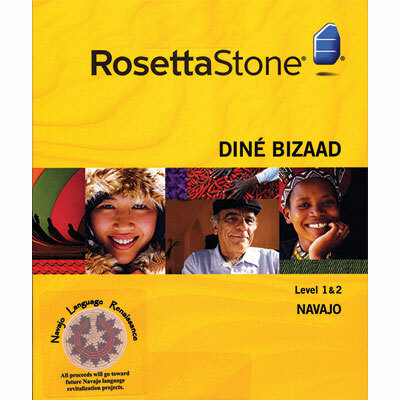 Keep in mind, the Navajo language software is not available on the main Rosetta Stone Website. You have to go to a special website called Navajo Renaissance to purchase it because is a special edition and part of Rosetta’s “endangered language project.” One of the cool things about Rosetta Navajo is that the course uses custom photographs that were actually taken on the Navajo reservation instead of the same pictures that are used in the other language courses. It costs 75 dollars for a one year subscription on the website, which is a better option than actually buying the software for over 200 dollars. It’s going to take you a lot less than a year to go through the program anyway. It is easy for me to say that this is the best program for learning Navajo since it is virtually the only one. There are very few apps or even books that teach Navajo, and the ones I’ve seen aren’t very good. Unfortunately, there just aren’t a lot of people interested in learning Navajo. Even though I enjoy learning foreign languages as a hobby, I stayed away from Navajo at first for a couple of reasons. Number one, it’s a dying language, and number two, I was told it is very hard for a white person to learn without having grown up with it. The reason I am tackling it now is that our church started the project of making a Navajo hymn CD as a way to reach out to the Navajo people. In the process of recording that CD, I started to pick up what some of the words meant. At first, I was casually studying the language just to make sure I was pronouncing the words correctly when I sang, but after a while, I started to realize that learning to speak Navajo might actually be doable. Don’t get me wrong, it’s a hard language, but it’s not as impossible as some people make it out to be. One of the reasons I am interested in speaking Navajo is that we have several Navajos in our church, and Lord willing, we will end up with a lot more through our soul-winning efforts on the reservation. When we knock doors on the “rez,” we offer people a free Navajo hymn CD and then present the Gospel. Even when people speak both languages, it is always a great icebreaker when you speak with people in their own native tongue. Not many young people speak the language anymore, but Navajo people my age and above often speak both English and Navajo. I’m in my mid-thirties, and my age seems to be the cut-off. There are even some very elderly people who speak only Navajo, so the language is definitely still relevant. On the first pass, as long as I was able to get a checkmark instead of a red X, I would continue to move forward in the course rather than getting hung up on trying to get a perfect score. Once I got a few units into it, I went back and did it again, trying to get a better score. I found that I had to go through everything at least three times, having a higher standard for myself each time through. After the third pass through each part of the course, I made flashcards for the really hard stuff that I still wasn’t grasping, so I disagree with Rosetta’s claim that you won’t have to do any rote memorization. One mistake I was making with the Rosetta interactive software is that when it beeped I would speak immediately. I didn’t realize at first that it was counting my pronunciation as wrong because it was cutting off the first part of what I said. It turns out, you have to wait until the thing turns green instead of talking immediately after the beep. Once I figured that out, the speaking portion of the lessons went a lot better for me. Overall, the Rosetta Navajo software is great, but one of the downsides is that you are tied down to a computer. Rosetta Stone has a mobile app for other languages, but unfortunately, the Navajo course is not as portable in that way since it is only available on the computer. Another negative is that there are only two levels instead of five like they have for the big languages. Now that I’ve finished Level 2, I’m not sure what to do next. The course is very effective, but it didn’t teach me everything I need. What I’m doing personally to further my education in the language is continuing to talk to people on the reservation as well as participating in a local Navajo language meetup that I organized myself using meetup.com. I am also watching some videos from a Youtuber called “Daybreak Warrior,” which have proven to be very helpful. Learning Navajo is a worthwhile endeavor if you live in Arizona or parts of New Mexico near the Navajo Nation, and I recommend the Rosetta Stone software as the way to get started.